Steve: Welcome to our listeners wherever you may be in the world today to the Becoming Your Best global leadership podcast. This is Steve Shallenberger and I welcome you. We welcome you. 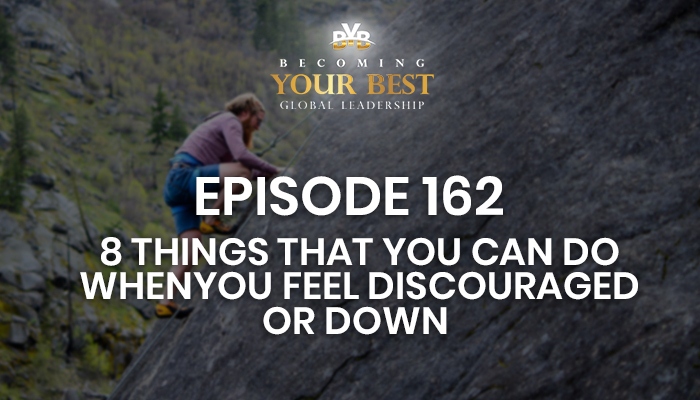 Today we have an important subject that we’re going to be discussing that affects every single one of us either directly or indirectly and so the title or subject that I’d like to talk about today is 8 things that you can do when you feel discouraged or down. Now this is an important subject primarily because in terms of productivity, happiness, joy, fulfillment, and getting great results discouragement or feeling down is a real threat to you. It affects your business, it affects your relationships, and it is the opposite of feeling highly motivated. So certainly, being highly motivated is the goal and that’s the state of mind that we want to be in most of the time. When we do have this malady hit us this discouragement are feeling down what can you do? Well that’s what we would like to talk about today. I wish we were here together in person and that I could hear your ideas on this as well. I’m sure you can add more to it. But let’s go ahead and go through these eight. 1.Control what you can control. Refuse to permit your thoughts to dwell on what you cannot control. Dwelling on what you cannot control literally is wasted energy and wasted time. This list of eight things are all things that you can control, and they help you defeat discouragement and to maintain this high level of motivation. These things will take some discipline but they’re not difficult and with time they become habits, that will bring you years of happiness, fulfillment, and success. Now let’s just give a few examples of controlling what you can control or not and the impact that it has. So, you cannot control what others think or say about you or what they do. So, in contrast what you can control is how you treat them. You can be nice. You can be generous and forgiving. These are just a few examples of what you can do that has a huge impact on your feelings. Here’s another example. You clearly can’t control government, but we can focus on electing good people that can influence our government. You cannot control someone cutting in front of you on the highway, but you can control your response. You can respond with kindness and patience and understanding and cutting them some slack. So perhaps they lost their job or had a terrible thing happen or maybe lost a big sale or received some bad news or just being rude. Well we can just be kind and cut them some slack versus what some people do is they’ll honk the horn and they’ll just get sucked in to this behavior by other people. So literally what you have to do is determine that you will not let others pull your chain. I’ve seen people that you know they start honking, they ride up 2 inches from the back bumper of the car in front of them. But I mean to tell you this type of escalation does not help you to feel highly motivated. As a matter of fact, it leads to further discouragement because you feel badly, you lost control of your feelings and your actions. Well these are just things that you can do. One of the things that you can control if you feel discouraged or down is you can be thoughtful about the contributing factors that might be contributing to this discouragement or feeling down. So, for example is there a health crisis? Did you have a major setback in your work or business or lose money? You may have money issues or maybe you’ve been served divorce papers or lost or changed your job or moved to a new location. So, there are many things that can contribute that get this kicked off and if you can understand it then you can really focus on controlling the right things. The things that will impact this and you have great creativity and imagination that we’re all blessed with this imagination and as we use it, we start coming up with answers. One of the things you can control is you can apply the six steps of problem solving, planning, and execution. So that’s number one. Just be focused on controlling what you can’t control. Just say that is my default if I feel this way. 2. Think only positive thoughts. Another thing that you can do is to think only positive thoughts. Be determined you will not let negative thoughts enter to your mind. Focus on the positive. Read positive material including reading and reciting poems or positive stories. Let me just share a couple of experiences. Earlier in my career anyhow, many years ago we had a sales, marketing, and publishing company and our sales reps and our administrative team and shipping department altogether we would hold a one-week training school and prepare and arm our sales reps to be successful. They were assigned all over the United States and would work, because it was a highly focused summer, sales because their college students and working to earn enough money to pay for their whole school year. They were very focused. This took a lot of intensity and when they got up in the morning, they had to be in a positive frame of reference right from the get-go. So, during the sales school one of the things we did is taught them how to have positive thoughts and maintain positive thoughts so that every person they talked with they could be a light a positive light somebody that was upbeat and then share their message and if people were responsive to it great, they could tell them more and if not then they move on. But leaving everybody a little bit better than they found. One of the things we taught them to do was to have positive self-talk. So, we would say things like I feel healthy, I feel happy, I feel terrific and we teach him to say it 10 and 20 and 30 times until they felt that way. And as they are driving out their area and by the way I sold a couple of summers when I was going through college, I remember vividly driving out to my area 7:30 in the morning getting ready. I would arrive you know at the first location at 8 a.m. I mean to tell you I would be discouraged some days. It wasn’t easy to get yourself motivated but I remember saying I feel healthy, I feel happy, I feel terrific. And we by the way over the years hired thousands of these individuals wonderful, amazing people who have gone on to change the world for good. And when we see each other today and this is decades later we still laugh and say I feel healthy, I feel happy, I feel terrific continues to have a big impact. In September of this last year one of our sons, Tommy and his wife Michaela, invited us to go to Yellowstone with their two young boys. One of them is four the others like two in that range and Forrest is the name of one of them. As we got in the car, I had the chance to sit in the back seat with Forest and of course we spent several days in the car together. I got in the car one morning and Forest said I feel sad. Well we had fun because I said Forrest, I want you to repeat something after me. I feel healthy, I feel happy, I feel terrific. And he said, no I feel sad. Well, by the end of the trip Forrest had said I feel healthy, I feel happy, I feel terrific at least 200 times. I mean to tell you once you got that boy going, You couldn’t shut him up. Well, it changed him, and his parents shared that when he got back home later, he’d be going around the house saying that I feel healthy, I feel happy, I feel terrific. Well this is something that you and I can do is think positive thoughts. Number one is control what you can control. That’s the focus. That’s the default. Number two think only positive thoughts and have a place to go. Repeat positive things. Positive puns. 3. Review your personal vision, annual SMART goals and pre-week planning. Review your personal vision, annual goals, and consistently do pre-week planning. I mean to tell you if you want to have a breakfast of champions, this is the breakfast of champions. You only do the personal vision one time and once you have it you have it and you’re really front loaded to be successful. Now you may refine it over time, and you do your annual goals once a year and these should be smart goals. Our recommendation and what we’ve found works best is to do them by your various roles in life. So personal and the different dimensions in our personal life, spiritual, mental, emotional, financial, health those things. So being thoughtful that we take care of ourselves but also like spouse or partner or parent friend or certainly work and professional whatever aspect that may be service to others how does that look. Well when you think about what you can do this year it is flat out inspirational, and this is motivating. This gives your place your mind a place to go that’s positive and inspirational. And then third is take a few minutes each weekend and through your roles think of what actions are most important as you bring your calendar of things to do all together and a plan that also is focused. You look at it and you say I’m ready to go! I see this! I’m prepared! So, these three disciplines putting them in place in your life will have a huge impact. And I might add, you’re really doing what Ralph Waldo Emerson said when he said sow a thought you reap an action sow an act and you reap a habit. Sow a habit and you reap a character and then sow a character you reap a destiny. Well, this is what helps arm us to be more effective when we feel this down feeling, we have a way to come back. We have a place to focus our emotions and energy and effort. And when we’re thinking of what we can control we say, oh yeah, I can do this. One of those things could be to serve other people. When we start feeling sorry for ourselves it just deepens the spiral. But when we start thinking about other people and how we can help them it helps lift us out of the abyss of discouragement and puts us positively in a much better place. I’d like to just give an example of this couple of weeks ago I was told about an acquaintance of mine by the name of Chas. Chas lives in our neighborhood about 10 houses away. He’s lived there a few years. They have five children and they’re a relatively young family. Oldest child is probably 14 and goes down to two or three years old. Well, on December 15th Chas’s wife handed him an envelope. So, can you guess what was in the envelope. Well, if you guessed a check for ten thousand dollars, you’d be wrong. It was divorce papers and Chas was totally shocked. He had no idea this was coming. So let’s just go back and think about this number three setting up and reviewing your personal vision, having an annual goal, and doing pre-week planning. Let’s just say for a moment, I’m not criticizing by the way Chas in any way this is not uncommon. How many times have we heard about this happening, but there are things that we can do about it to prevent it? So, if Chas is vision under a spouse or partner was to treat my spouse like a 10 and to help her or him be happy on a scale of one to 10. So that’s the vision. What kind of goals could you have this year that support that kind of vision? Well you could say well we’ll go on two dates without the children per month. So, 24 dates during the year. Something else you could do is regularly check in and do an assessment. How are things going? How is your partner feeling? So, on a scale of one to 10 you could say you know Janie on a scale of one to 10 how are you feeling like on a happiness scale. How are you feeling and if Janie says well you know I’m a three. Well what does that tell you? It tells you have some work to do. If she says I’m an eight. Well that’s good news you know you’re headed in the right direction then you can ask well on a scale of one to 10 how do you feel our marriage is doing. If Janie says, well I think we’re at a one. Well that tells you something right. If she says well it’s going great, we’re like it in seven or eight or nine. Well that’s a different answer altogether. How about on a scale of 1 to 10 how’s your health? Okay, so these are examples if you do this another goal you may have is to put a letter of appreciation under his or her pillow two times during the year. These are examples of goals you may have. And then during the pre-week planning what you can do is say what will I do this week. Okay, I’m going to have a great date this week. And you actually then say when will I do it. Well this is how the process works. It’s enormously powerful. But in this case think of the impact these actions this frame of reference would have had on Chas and his wife, we’ll call her Janie, if he had done this a year ago so a year ago January, they’d all gone on a date. It worked on a great date and during the date he can say, well Janie on a scale of one to 10 how are you doing? How about in your happiness? How about on our marriage? How about your health? I would suggest to you that as you do these things these are controlling what you can control it can save your marriage. It can build a strong relationship and definitely it can defeat the things that cause discouragement and feeling down. Think how down Chas is going to feel now. How discouraging it’s going to be? He’s going to have his moments. He’s going to have child support and he’s going to have alimony perhaps. It’s not going to be easy. It’s a tough road but now you’re in this situation. You can do all three of these things we’ve just talked about and they will help you get to a better place. Oh, my goodness, I mean you think about sleep and how important it is virtually every person that I’ve had the chance to visit with about this talk about how important sleep is. It’s interesting. It’s not easy to sleep when you’re feeling overwhelmed and as a matter of fact, nearly two thirds of Americans say that they lose sleep because of stress, but the facts are certain things can affect sleep. There is also a determination to say I am going to get adequate sleep and I’m going to find a way to get good sleep. So, we’re aware of some of those factors. It is clear that absence of sleep or sleep deprivation leads to greater risk of depression, anxiety. Certainly, all these other health factors increase risk of heart disease, cancer, impaired memory, reduced immune system, weight gain. So big stakes here at getting adequate sleep. This is a big defense against feeling down it’ll help you come back. And so that’s a big one. Ask for help and strength. And remember you are not alone. This is an enormous source of strength and I remember feeling at some of the lowest points in my life and as I turned to prayer and meditation, I found peace and I found strength that ultimately has lasted throughout decades. That’s the impact that it’s had. And I know that I have somebody that I can reach out to that I can find comfort and strength in I can find a perspective and a purpose. Let’s do a little review of the first five. 1. Control what you can control. 2. Think only positive thoughts. 3. Review and be sure you have in place a personal vision that inspires you, that’s meaningful. You have annual goals that are set for the year smart goals and you consistently do pre-week planning. 4. Get adequate sleep. 5. To pray and meditate. 6. Make a list of things for which you are grateful. Express your gratitude to other people. Call someone and thank them for being an important part of your life. And just watch how your feelings shift and it could be a child or a spouse, relative, friend, a mentor, somebody at work, a work associate. We are a big proponent of using a notebook or a journal, but you can have a section say five or six or seven pages dedicated to what you’re grateful for. By the way, in my journals that I have or notebooks in the back I leave a few pages for my index and I number every single page and then it’s really easy to go back and have quick access to these sections. But wow, what a huge impact when you start dwelling on all the things, you’re grateful for, it really starts shifting your moods and puts things in perspective. 7. Get out and exercise. If you can, get outside into nature, if that’s possible. It’s all the better where those circumstances allow, or you can walk or jog or ski or whatever it might be. During the winter, and at least in the state of Utah, where our home, it’s cold. So, we have a mall close by, University Place. It’s a beautiful place and we can walk a couple of miles at a time and it’s interesting and fun. It’s warm so you can kind of pick things out that are interesting as you are walking along, but exercise is huge. I exercise inside, I mix them up and I also go outside. I have a regimen where you know the big Ron Williams workout, I love it, the build and burn. I have a bike that I ride. So, I mix these up and they help give me a variety, but I’ve got to say maybe your experience has been the same that I cannot remember a single time when I went out and exercised or participated in an exercise that I didn’t feel more upbeat. That I didn’t feel energized. That my mind wasn’t exercised and stimulated thinking new ideas. So, number seven get out get some exercise. This is at the very heart of human willpower and the human spirit of never giving up. There’s so many examples. I know you have many examples as you reflect upon them in your own life and also in the life of others. I was thinking about Anne Sullivan and Helen Keller this morning. Oh, my goodness what a story of never giving up. And in her own life, Anne Sullivan, who was Helen’s teacher, suffered from blindness. It was hard for her to see. She had restricted vision. She had been in a home, a foster home or an orphanage. She had her own challenges, but she became educated, she wanted to learn, and she ended up with a mentor and when she became of age, she wanted to go out and teach others and she became aware of Helen Keller’s parents, that they had a need with Helen. Helen was a young girl. She was both blind and deaf. Anne was able to patiently work with her as she helped Helen fight through anger and emotion and all of a sudden started learning. Oh, my goodness, Anne would hold her hand under water and spell it out in her hand and earlier in this young life Helen wouldn’t understand what she was doing. But one day, oh my goodness it hit, and Helen’s life just came to life and she wanted to learn everything that she could. This led to a lifelong inspiration of wanting to learn and to improve. She, Helen Keller, and Anne Sullivan were working on becoming their best. Now it’s really interesting because you just know there were many moments of discouragement, but they didn’t give up. They kept at it. Now I would like to just pause. That’s a great story. There’s so many others who just keep trying, keep putting one foot in front of the other. I was just thinking as I’ve looked at this list of eight things that Becoming Your Best has some great resources for you that can be helpful. Let’s take number three for example, of working on your vision, annual goals, and pre-week planning. We have a free resource that we can provide you on how to do that. A format of how to write your vision, a place to put your annual goals, and some ideas on how to do pre-week planning. So if you just write to us at support@becomingyourbest.com just let us know you listened to this podcast of eight things you can do when you feel discouraged or down and that you would like to have this resource on the best way to do a vision,, set your smart goals for the year and some ideas on pre-week planning and we’ll just send that out to you. Well okay now I would like to finish up. I would like to recommend there are some things that you don’t do and here are a few things of what not to do. First of all, be determined you won’t binge. And the definition of binge is a short period devoted to indulging in an activity of excess especially drinking alcohol, drugs, eating. (I’m just quoting out of the dictionary) watching movies, playing video games. Those I added. Surfing on your device, shopping maybe. Anyhow don’t binge! Just be determined you’re not going to participate in counterproductive things that don’t help because it doesn’t help, and you end up back where wherever you started, and you’ve wasted time and emotion and sometimes money. Don’t dwell on the blue or discouraging feelings. Get back to these eight things and say I am going to go to work. I’m just going to control and what I can control. I’m going to think positive thoughts. I’m going to look at my vision and annual goals and pre-week planning and I’m going to be focused. That gives your mind a place to go and I am going to get adequate sleep. You’re just going to find a way to do it and where it fits for you, consider praying. Certainly, meditating and make a list of things. Number six for what you’re grateful for. Get out and exercise and where you’re able to get out and nature that’s wonderful that’s just frosting on the cake. And last of all never give up. Then that would be also what not to do the last which is don’t give up. Remember, the dark will all turn bright. There’ll be a better day. And sometimes it’s when you’re at your darkest that you’ll find your best that it precedes your greatest successes in life. So, these are the thoughts that I’d like to leave you today I hope one has been helpful for you. May these eight things that you can do when you feel discouraged or down be helpful to you and perhaps others that you could share these with that might have that feeling from time to time, where you can be a light to them. This can be a place of discussion where you can talk about it and talk about the things you’ve learned and you’re doing and what are they doing so that you can invite them and encourage them to get to a better place. Thank you for being with us today remember every single day you’re making a difference. You can be a light. That’s what leadership is. You can help things get to a better place. This is Steve Shallenberger with Becoming Your Best.